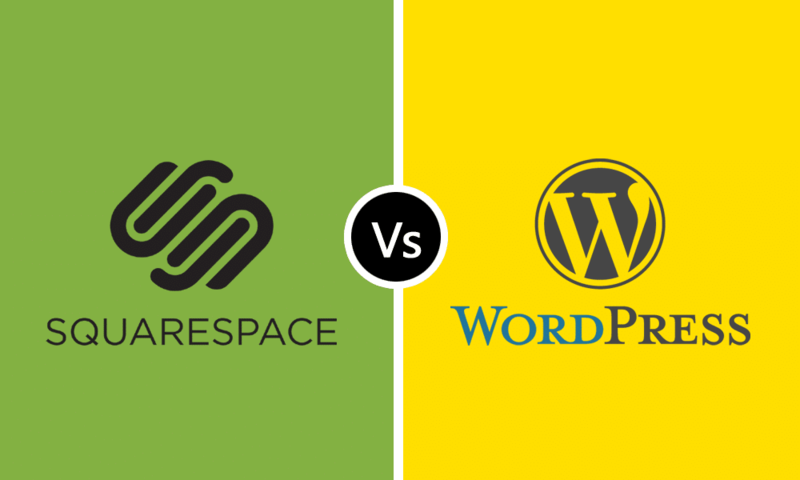 Squarespace vs WordPress – Which one is better? Creating a website is not a simple task. It requires thorough research on the platform choice, implementation, and execution. In the beginning, it is common to find new business personals or individuals new to blogging stuck in choosing their platform of choice. Today, we will go through Squarespace vs. WordPress – a choice that almost everyone who is entering the web world has to make while choosing the perfect website builder for their site. Which one should you choose? We will compare each of them and understand which one is better. However, before we start, let’s introduce the two platforms briefly. WordPress: WordPress is the most popular content management system(CMS.) It is free and open-source and first came into existence, 14 years ago, in 2003. Matt Mullenweg developed it. Squarespace: Squarespace is a content management system with a focus on software as a service. It is developed by Anthony Casalena and was founded in 2003. The first aspect that we are going to compare is the ease of use. When it comes to WordPress, you can tag it with medium ease of use. It doesn’t require any coding to create a website in WordPress, thanks to its rich ecosystem of themes and plugins. Also, learning WordPress is easy with tons of available online resource. This means it can be used by beginners especially using the WordPress editor to add content to the blog or website. In comparison, Squarespace is far simpler. In Squarespace, you get the option to add images, text, video, etc. easily. The editor is also user-friendly and has nothing complex to offer. In short, Squarespace is considered simpler due to the absence of high-level complexity that WordPress has. Both the platforms are easy to start, with Squarespace slightly easier compared to WordPress. Both the platforms offer a different ecosystem for their users. Ideally, WordPress is considered more flexible than Squarespace, but has some drawbacks as well. By using WordPress, you are free to edit the code, use the free plugin and theme repository on WordPress.org, hire WordPress developers to create custom plugins for you, and so on. This leads to high flexibility for you to add new features and maintain your website the way you want. But, it has its drawbacks as it is easy to find low-quality plugin or theme, which can mess up your website if used. In short, the flexibility brings responsibility on the part of the owner to make decisions and ensure that he only uses any random plugin or themes. You can also find paid themes and plugins which are far better compared to the free ones. Squarespace offers a closed ecosystem where everything is offered and managed by Squarespace. It is not open source, and hence, you will find high-quality features/plugins and themes within Squarespace. Squarespace maintains everything themselves and their in-house development team is responsible for the development. This means that you will always get high-quality add-ons and services. Also, they provide better support compared to WordPress where you might have to depend on the community to get your problems solved. WordPress is free to use, but that doesn’t make everything free. You need to buy a web hosting — can be virtual, shared or dedicated. Then you have to register a domain, hire a developer or WordPress expert to gets your website up and running. The list just goes on and on. The only good thing here is that you will get cheap WordPress, making it easy for you to put up a new website. Not to mention, you need to spend more on paid themes and plugins to incorporate more features on your website. Maintenance is also required if you plan to run the website for a long period. Squarespace costs come down to the monthly payment. They have two packages at the time of writing — Personal($12/month) and Business($18/month). The business plan offers more features compared to the personal. You almost get the same core features with both the plan. However, if you are aiming to open an eCommerce or business website, it is ideal to go with the Business plan it gives a lot of benefits to those type of sites. In conclusion, WordPress offers you better plans compared to Squarespace. However, if you have a fixed budget, Squarespace is the way to go. WordPress provides one of the best eCommerce features. First of all, it is completely eCommerce compatible. It comes with tons of useful and feature-rich eCommerce plugins which includes Payoneer, Paypal integration, affiliate links, and so on. There are also plenty of eCommerce themes you can choose from. Overall, it offers great eCommerce support. Squarespace, on the other side, offers fewer features compared to WordPress when it comes to eCommerce. It only supports Stripe as the payment gateway. It supports most of the countries out there but still can limit an eCommerce website which is going truly global. Earlier they had a limit on the number of items you can sell on both their plans. However, they have changed it to unlimited selling for the business plan. In short, if you are looking to build an eCommerce website, WordPress is a far better choice. WordPress has one of the best ecosystems out there. It supports tons of plugins and themes that in return offers one of the best design and features to their users. Squarespace is limited when it comes to providing options to the user to improve features and design for their website. You can only choose from the available options, and you can not integrate or build new features to your website. In conclusion, WordPress wins hands down in customizability, design, and features. When it comes to data, you should always ensure that it is backed up and have portability. Both platforms offers data portability in their own way. WordPress export feature is robust and there are also plenty of backup solution available for it. This means that you can always change your web hosting without any issues. Squarespace also supports export features, but are limited as you can only export in the form of XML. Also, few data cannot be exported such as audio, text, pages, video. In terms of data portability, WordPress beats Squarespace. When it comes to choosing a winner between WordPress and Squarespace, there is no doubt that WordPress beats Squarespace by a long margin. So, if you want to take control of your data and have better customizability and features, you know what to choose! Do you think the same? Comment below and let us know.